Q: Is Tim Elhajj Available to Come Speak with My Book Group or Writing Group? A: Absolutely. One of my work colleagues asked me this and I was thrilled to hear it. Thrilled! I love to talk about the book. Recovery. Writing. Memoir. 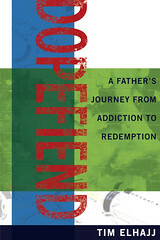 Parenting in the wake of heroin addiction. Anything. It’s all fair game. And you don’t have to like the book for me to show up. I’m really thrilled to talk about the work. For me, talking to people about the book represents a huge milestone in my recovery. When I was using heroin, I thought it was enlarging my world. This was an illusion. My world was actually shrinking. Recovery has been about doing the hard work required to actually expand my world. Over the years, I’ve had many milestones. Everything from being allowed back into my mother’s house to starting another family. In the last few years, the milestones have been fewer. But the readings and events have been a huge gift to me. Huge. I’d love to speak with your group. You can reach me here: tim@telhajj.com. If you’re far away, maybe we can use Skype. Q: How Do You Pronounce Elhajj? A: Everyone asks this and it’s totally fair. You pronounce it phonetically like this: L Hodge. Some Arabs might bicker, but it’s close enough for me.